Why talk about water in the middle of winter? It's the season many athletes forget to drink! Water is a wonderful performance enhancer. When a star U Conn basketball player took the advice of his sports nutritionist Nancy Rodriguez RD and started drinking enough to consistently void a light-colored urine, he was amazed at how much better he felt all day. Unfortunately, too many athletesincluding runnersoverlook the power of this essential nutrient. Perhaps it’s your turn to give water a try? 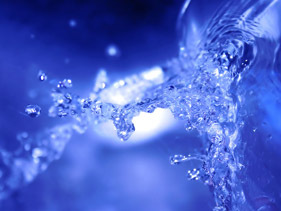 This article offers droplets of information to enhance your water IQ, optimize your water balance, and help you feel & perform better. • To determine how much water you lose when you sweat, weigh yourself (with little or no clothing) before and after an hour of hard exercise with no fluid intake. The change in body weight reflects water (sweat) loss. A one-pound drop in weight equates to loss of 16 ounces of sweat. A two-pound drop equates to 32 ouncesthat’s one quart. Drink accordingly during your workouts to prevent that loss! • Is bottled water better for you than tap water? Doubtful. According to the Center for Science in the Public Interest, nearly half of bottled waters come from municipal water suppliesnot from the mountain streams pictured on the labels. This suggests standard municipal tap water is high quality.